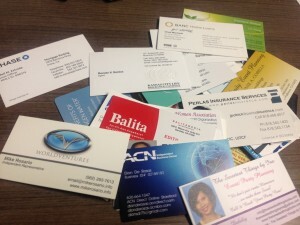 What to do with all these business cards? It’s the morning after a big networking event. Some of the luster is starting to wear off from the excitement of meeting new people and exchanging ideas. If you’re like me, you can vividly remember faces and personalities, but hardly remember names. What do you do with all the cards? Enter all of them in your database and send them SPAM? Call all of them and immediately start pitching your product or service? Unfortunately, inexperienced business owners will commit several mistakes that will eliminate any possibility of new meaningful relationships. Seasoned Chamber members have strong habits to create a lasting connection. 1. Make a lasting first impression. From the first handshake, make sure your exchange is a memorable one. In the business world, too many people are interested in talking — not listening. You’ll be surprised how far a few simple, genuine questions about them will take you. It will gain more points when you actually remember these little details about them in future conversations. 3. Networking isn’t a sprint — it’s a marathon. Too many inexperienced business owners set the wrong expectations thinking they can land referrals from the very first meeting. Like any conversion funnel, relationships take a while to build and require several meaningful touches. 4. Choose quality over quantity. I remember some of my first years as a member of another Chamber of Commerce trying to collect as many cards as possible. This would be often followed by disappointment when I call them the next day. Many wouldn’t remember me or want to meet for coffee. Today, I’d rather make one meaningful connection at a networking event over collecting 30 business cards of people who don’t remember me. 5. Find ways to align yourself. 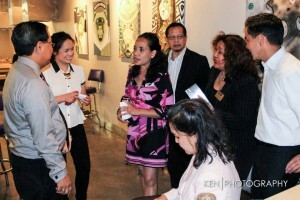 All events bring a variety of people representing different products and services. While your trade may vary drastically from someone you meet, you can always find common obstacles your businesses are facing. While just about everyone will tell you, “business is doing great,” everyone’s business can always get better. Try to share something that has worked without implying that their business is failing. 6. Follow up. In most cases, I glance at a business card and ask, “Is this your cell number?” If not, I try to write it down or enter them into my phone contacts depending on how strong the chemistry felt. Once you have their information, make sure you call them the next day and invite them for coffee or a face-to-face conversation. If they don’t answer the phone, most will be ok with a text message. Ready to make new connections? Sign up for our May 21st mixer!